TÜV SÜD (Munich, Germany) a long time provider of IEC 61850 Interoperability and Conformity Testing Services closes their Test Lab. They emailed today says: "... Unfortunately, we do not supply Interoperability and Conformity Testing Services according to IEC 61850 any longer, which have been replaced by other focus areas in our portfolio. ...". There was no specific reason for their decision provided. The standard series IEC 61850 is very comprehensive - applicable in many different application domains. Implementations of the communication software for Client/Server (MMS based), Publisher/Subscriber (GOOSE), general APIs, and appropriate IED specific configuration tools are very comprehensive (and very complex!) as well. The IEDs tested and certified will likely operate in applications that need many times more logical nodes (and associated FUNCTIONS) than what was tested to get a certificate. MMS is also very complex regarding services and protocol. Unfortunately requires a lot of best skills to implement ... it has been implemented very well by a few companies like SystemCorp. The most crucial aspect of IEC 61850 is the huge number of logical nodes (that represent so many functions). This semantic is of great importance to the energy industries. One of the key issues in the years to come is this: Use the semantic of IEC 61850 and configuration language and map the needed (usually very simple and restricted) semantic configured in a SCL file automatically to JSON-Objects and communicate the JSON encoded information via http(s) or similar protocols. This will allow to use IEC 61850 in any project that requires to exchange the well defined semantic of IEC 61850. E.g., the semantic of the schedule logical node (FSCH and FSCC) can easily be configured in JSON. The underlying function (the SCHEDULING) needs to be implemented independently of using MMS/ASN.1 or JSON. The benefit of using JSON is here: Everybody that can program in Python or JS or ... can use the JSON encoded messages directly in the application program. I am working on such a solution that makes IEC 61850 really applicable for simple applications ... http(s) and JSON are used everywhere and can be applied by everybody. For those simple applications with a dozen of points or so ... there would be a need for just a very simple and basic interoperability and conformance test. The IEC 61850 Tissue Data Base is in operation again - now under IEC Logo. The registration as a new user will be possible soon. The German National Committee of IEC TC 57 (DKE K 952) has many members of various Working Groups (in the national as well as in the international groups) that discussed the IEC 61850 standard series in general and particularly how the standards could be applied to substation automation and protection. One of the key issues is the modelling and configuration using SCL. Click HERE for the link to the above page. Cyber Security for Industrial Control Systems (ICS) is Going Where? Cyber Security for Industrial Control Systems (ICS) has been discussed over many years - and it will be discussed forever. There seems to be no end of discussions and solutions ... the end may come when electric power will be switched off - caused by insecure systems. As long as we have ICS in operation - which is very crucial! - we will see products being developed and offered that are marketed to safe the world of ICS. Dale Peterson wrote a very nice and interesting article about "The Future of the ICS Cyber Security Detection Market" (23 July 2018). Dale seems to expect that the ICS Cyber Security Detection Market will completely change in a few years. He may be right. My expectations is that the change will happen for ever - and ever faster. So, you may decide to wait! This would be the worst decision you can make. Whatever is available for your system today - use it! The wait for getting started with, e.g., encrypted ICS protocols is over - use TLS wrapper as much as possible - as soon as possible. Click HERE for the complete article - worth to read. Our power system highly depend on ICS - ICS highly depend on power systems. The two can live together only. Non of the two will survive without the other!! "Hence we must believe that all the sciences are so interconnected, that it is much easier to study them all together than to isolate one from all others. If, therefore, anyone wishes to search out the truth of things in serious ernest, he ought not to select one special science, for all the sciences are cojoined with each other and interdependent." Finally we will have to accept that reliable electric power will be more expensive soon - moderate increased price in case we care about ICS Cyber Security - extremely expensive if we fail to protect the power system. implement deeper monitoring and new smart grid applications. The new equipment to be deployed in order to solve today’s issues (MV voltage and reactive power regulation for example) will necessarily have to be adjustable and upgradeable in order to face challenges of tomorrow (for example massive electric vehicles fleets, low voltage automation, …) which will arrive long before the end of its 20 years’ service life. Furthermore, there is a necessity for the equipment to adapt to the evolving and growing cybersecurity threats. The equipment will therefore need to be patched, updated and reconfigured, and this has to be done remotely due to the great number of equipment. This is a cornerstone of the System Management (SM), which refers to functionalities that are not directly linked to the operational role of the equipment but allow it to perform its operational functions in the best conditions possible. Smart Grid Devices Management also includes other functions such as asset management or supervision. These functionalities need to be managed by the grid operator and address multiple devices from different vendors through independent Information Systems and thus the requirements and exchanges need to be standardized. As these are to be applied to IEC 61850 compliant equipment, these mechanisms need to be integrated in the standard. ..."
The part 8 is currently a Technical Specification. This will change in the next step. remote (via dial-up or wireless media) access to the object by a remote automated computer agent, e.g. another object at another substation, a distributed energy resource at an end-user’s facility, or a control centre application." We’ve raised the stakes by connecting more physical systems and facilities to wireless networks -> Consequences of failure are more dire. IoT security is a special challenge:The adversaries are unlike any we’ve seen before. A connected product that generates a small profit may require years of updates, patches, and security evaluations. Many connected devices live in environments unlike any IT system. In a home, there’s no IT manager to push patches to a connected fridge. And in an industrial setting, patching one machine might cause it to stop working with other equipment on the line. IoT devices and systems require in principle the same attention, efforts and resources like traditional IT systems. The sheer unlimited number of interconnected IoT devices will work securely only if we except to spend much more money than what the market expects! Or: Today´s solutions will be the problems of tomorrow. Click HERE for the complete document (1 page). Click HERE for the real-time data access. Click HIER für den Zugriff auf das gesamte Dokument. an Wartungsprozesse, Projektorganisation und Entwicklungsprozesse behandelt. an technische Komponenten und Systeme und für die Projektabwicklung relevanten Prozesse. auf die Normen ISO/IEC 27001 und ISO/IEC 27019 verwiesen. Die englische Version wird in Kürze erscheinen. Die hier beschriebenen Anforderungen haben erheblichen Einfluss auf Unternehmen im Kontext der Energieversorgung: mehr Mitarbeiter und mehr technische Hilfsmittel, mit denen die Anforderungen erfüllt werden könnten - und damit höhere Kosten! "An important market trend is to enable the operation of DER in islandable mode supplying a local process such as campus, buildings, industries, …. Thus it is important to complement the existing and/or coming IEC 61850 series of standards to support such an operation mode, including the protection of considered assets, the management of their transitioning between grid-tied and islanded mode, but also to the support the management of frequency, voltage, and quality of supply to the process. ..."
Comments to the proposal are welcome by 2018-07-20 at the latest. An Electrical Energy Storage system (EESS) is a system which is used for the purpose of intermediate storage of electrical energy. The type of storage, the amount of energy, charging and discharging rates as well as self-discharge rate and many other characteristics are technology dependent and therefore can be very different. However, the general meaning of the characteristics and parameters are identical. modelling for operating an EESS regardless of any specific technique, which supports an efficient way of integrating an EESS into grid operation and other businesses. Various types of EESS, such as battery, pumped hydro, superconducting magnetic energy storage, flywheels, etc., are defined in “IEC White Paper on Electrical Energy Storage.” According to the the white paper, EESS systems are classified by energy form, advantages/disadvantages to the specific usages or the purpose of the implementation. ... "
"Increasing numbers of DER (distributed energy resources) systems are being interconnected to electric power systems throughout the world. As DER technology evolves and as the impact of dispersed generation on distribution power systems becomes a growing challenge – and opportunity – nations worldwide are recognizing the economic, social, and environmental benefits of integrating DER technology within their electric infrastructure. 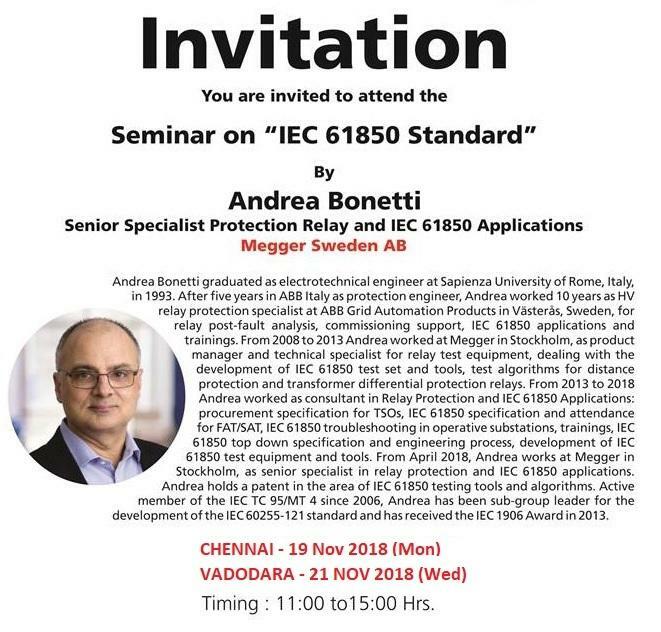 • IEC 61850-90-15: DER Grid Integration using IEC 61850 "
This document is one of the crucial parts for the application of IEC 61850 in distributed power systems. Great Article on Internet Insecurity - a New Approach!? The paper suggests a radical new approach in dealing with security or insecurity. "Every organization that depends on digital technologies and the internet is vulnerable to a devastating cyberattack. Not even the best cyber hygiene will stop Russia, North Korea, and highly skilled, well-resourced criminal and terrorist groups. The only way to protect your business is to take, where you can, what may look like a technological step backward but in reality is a smart engineering step forward. The goal is to reduce, if not eliminate, the dependency of critical functions on digital technologies and their connections to the internet. The sometimes higher cost will be a bargain when compared with the potentially devastating price of business as usual." Der FNN-Hinweis "Lastenheft Steuerbox - Funktionale und konstruktive Merkmale" ist jetzt verfügbar und kann zum Preis von 39 € erworben werden. Das Lastenheft "Steuerbox" liefert die erste Grundlage für ein standardisiertes Steuerungssystem, das in der Architektur des intelligenten Messsystems betrieben werden kann. Hier für die Leseprobe klicken. Hier finden Sie den Shop. Die FNN-Steuerbox basiert auf standardisierten Lösungen für den Informationsaustausch. Für die Fernkommunikation mit den Steuerboxeb wurde eine Untermenge an Modellen und Diensten aus der Normenreihe IEC 61850 ausgewählt und näher spezifiziert. Es kommen Services wie DataSet, Report Control, Log und Log Control, Control ... zur Anwendung. Als wesentliche Modell kommt das Scheduling (Fahrplansteuerung) zum Einsatz. "In der Niederspannung sind basierend auf den FNN-Anwendungsfällen folgende Teilaspekte relevant. Die Realisierung einer netzdienlichen Fahrplansteuerung dient in erster Linie dem Ersatz der heutigen Heizungssteuerung (Nachtspeicher, Wärmepumpen, Warmwasser) durch das intelligente Messsystem und unterliegt u. a. den Anforderungen einer autarken und zuverlässigen Schaltfahrplansteuerung sowie einer zeitsynchronen Tarifierung. Die Steuerung von einzelnen Lasten und Erzeugern in der Niederspannung kann durch externe Marktteilnehmer erfolgen und ist i.d.R. als unkritisch zu bewerten. Die dabei betroffenen Stückzahlen sind im Anwendungsfall der Heizungssteuerung mit deutschlandweit ca. 2 Mio. Anlagen sowie einer Leistung von ca. 15 GW erheblich. Im Bereich der erneuerbaren Energien sind derzeit ca. 1,5 Mio. PV-Anlagen installiert, von denen perspektivisch ein großer Teil steuerbar sein soll - Tendenz steigend." Click HIER für mehr Informationen. "The IEC 61850 standard series offers a broad basis for communication networks and systems in power utility automation. Due to its broad coverage of power utility automation applications, it is up to the standard’s user (utility, vendor, system integrator…) to pick and choose specific options from the standard in order to meet the requirements of the intended objective. As a consequence, implementations of IEC 61850 represent specific subsets of the standard. These profile types target on reducing complexity and facilitate interoperability for their specific scope and during engineering and device / substation lifetime. In order to achieve both these goals - a properly defined profile and appropriate implementations (processes, tools, products) that support the profile are required." Note that IEC 61850 is not that complex - but it is very comprehensive!! The most crucial challenge is this: How can I find what may be of interest for my application? I hope somebody will do a good job in preparing an overview of models published and under preparation. "The scope of the proposed TR is to provide a comprehensive analysis of increased challenges encountered in the field where substation network is adopted, and to propose a novel resolution which is SCD based substation network auto-routing with visualization and supervision." I am happy to see that this draft proposal as been published - it will implement what I have been said for years in my seminars: SCD documents are containing a lot more than just Logical Nodes ... more to come. Stay tuned. Click HERE for the list of National Committees involved in IEC TC 57. CEWE Instruments exhibits at the Hanover Fair the Prometer 100 family of high-precision four-quadrant energy meters with advanced measuring, logging, power quality monitoring and data storage capabilities. Please note that the meter has been certified by the UCAIUG for IEC 61850 compliance. Cliock HERE if you need a ticket for the fair in Hanover. defined by IEC 61850’s System Configuration Language (SCL). ..."
Wow, this is really a major step forward! FMTP Power AB (Uppsala, Sweden), KTH (Royal Institute of Technology Stockholm), Håvard Storås (Security expert), and NettedAutomation GmbH (Karlsruhe, Germany) have each long-term experience in the application of standards for protection and control as well in secure communication and SCADA applications. HIER für Details in Deutsch klicken.